The Legend of Zelda: Breath of the Wild features a lot of classic Zelda enemies (a lot of people don’t remember, but the Lynel appeared right back in the original NES Zelda), but the most significant and memorable new antagonists are the guardian: hulking mechanical creatures with death rays capable of ridding you of 10 hearts off in one shot. These things are all over Hyrule to begin with and they’re utterly deadly, but worse still some of the later areas of the game are absolutely packed with them. 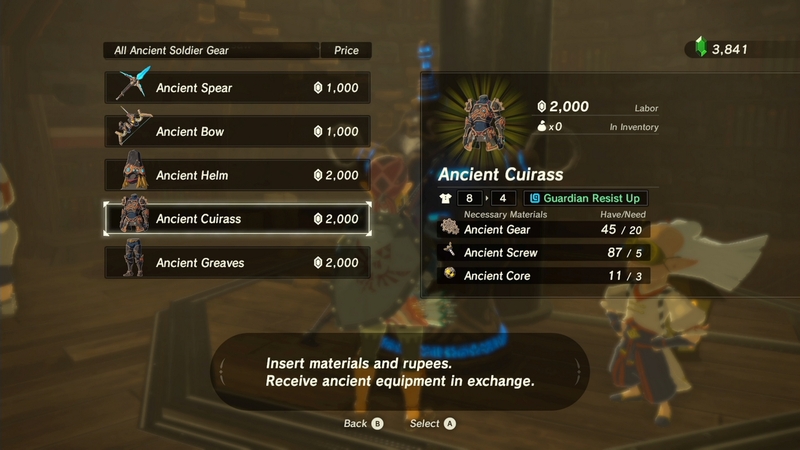 But here’s the good news: there’s an armor set in the game that was also made by the Guardian’s Sheikah creators – and it packs a very handy passive skill to resist attacks from guardians. Get the full set and you’re in for an even better bonus. Each piece of the Ancient Armor, as it’s called, features the ‘Guardian Resist’ ability – which basically means that with each piece of the armor you equip your ability to survive guardian blasts rises significantly. With a complete set you can actually take a couple of blasts full-on and not die, which is pretty damn good for storming Hyrule Castle, since the seat of power in Hyrule is swarming with all different types of these things. This ability is just the beginning, however, since the other bonus is even better still. The Ancient armor has a base defence stat of 4 per piece, though through the Great Fairy Fountains this can be boosted to a maximum of 28 per piece – making it the joint-strongest set in the game, and only one non-set piece of armor (the Champion’s Tunic) outstrips it when fully upgraded. When the full set is equipped together and the armor upgraded twice or more there’s an additional bonus, too: you’ll gain the Ancient Proficiency buff, increasing the damage you do with ancient-type weapons by a massive amount. Smaller guardians drop these weapons in shrines, but you can also buy and craft them in the Akkala Ancient Tech Lab. A Link equipped with this full armor set, upgraded and with ancient weapons is the most powerful Link you can create. All of the Ancient Armor set is available from the Akkala Ancient Tech Lab in the far north of the Eastern Akkala region of Hyrule. Unlike most armor in the game that’s sold there are additional requirements for you to get your hands on it. Ancient Helm: 20 Ancient Gears, 5 Ancient Shafts, and 3 Ancient Cores. Ancient Curiass: 20 Ancient Gears, 5 Ancient Screws, and 3 Ancient Cores. Ancient Breeches: 20 Ancient Gears, 5 Ancient Springs, and 3 Ancient Cores. These items are actually fairly common out in the world of Breath of the Wild with a notable catch – each is a common drop from guardians, so you’ll be required to go out hunting the very things you want protection from. Before you go hunting, it’s worth exploring some of the wastelands where many guardian corpses can be found> These are scattered all over Hyrule, and the dead guardians can often be looted for some of the needed items. If you can pick up something heavy with magenesis you can also flip rotting, dead guardians over – you might find loot underneath them when you do. Remember that an ancient arrow (also sold at the ancient tech lab) to the eye will take down Guardians in one clean shot. All you need to do is aim for the Guardian’s eye – place the shot well and they’ll explode spectacularly. Good luck hunting – this armor is worth it.